Of all the scholarly work on the countryside done in pre-1917 Russia and in the Soviet Union in the 1920s, that of L.N. Kritsman and those influenced by him – the so-called ‘Agrarian Marxists’ – is perhaps the least well known. However, that work was of extremely high quality and very original. Its significance is more than historical, since it has great relevance to the study of peasantries in contemporary poor countries – especially to the analysis of peasant differentiation. 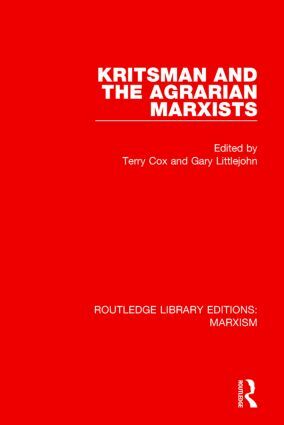 This volume, first published in 1984, has been prepared by two specialists who have been working on Kritsman and the Agrarian Marxists for several years, and will help dispel ignorance of this important body of writing. It consists of two substantial essays, and an abridged translation of one of Kritsman’s most important works: Class Differentiation of the Soviet Countryside (first published in 1926 and never before translated into English).